Plus Size Kitten: Benefit Sales! Just got back home from shopping today. I could not post this news up but looks like u girls won't miss it out! did anyone go? what's on sale? is That Gal on sale? please let me know. I want to get a few things too if I could go tomorrow. Till then, I need to take a warm bath and retired to bed early. 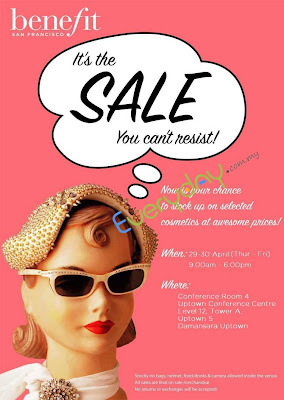 Oh before I forget, anyone wanting to know what's this sale like you can check out my past posts on it, with price and products offered and what I have experienced by searching for Benefit Warehouse Sales or Benefit at the search button available on the right side of my blog below the chatbox. everytime i'm out of cash... they are having this great sale...just got to know that parkson elite are having sale for handbags......why owh why!!!! !